On Thursday, Nordstrom posted sales and earnings for its second quarter that beat Wall Street expectations and the high-end department store chain raised its full year outlook, citing the momentum it has gained from it online business as well as strong traffic at its discount store Nordstrom Rack. Its shares were up more than 13% during afterhours trading following the news. Earnings at Nordstrom followed mixed results from both J.C. Penney and Macy’s, two of its biggest rivals, which both being hit with sharp drops in share prices as investors become concerned over pressure on margins and a buildup of inventory. 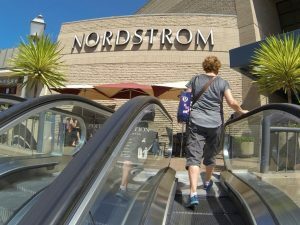 However, Nordstrom managed to stave off some of those same pressures through keeping a smaller footprint in real estate and trying new concepts such as stores that do not sell merchandise. Nordstrom said that its solid performance for the quarter was driven for the most part by a higher sales volume, an effective tax rate that was lower, and impact from new revenue as related to the chain’s annual sale event celebrating its anniversary. Net income at the retailer for its three-month period ended August 4 reached $162 million equal to 95 cents per share, in comparison with last year during the same period of $110 million equal to 65 cents per share. That was above average estimate by analysts for 84 cents a share. Revenue was up more than 7.1% ending the quarter at $4.07 billion and ahead of analyst expectations of $3.96 billion. Sales at stores opened for a minimum of one year were up 4%, which far exceeded analysts’ expectations of 0.8%. That included sales growth at same-stores of 4.1% for the full-price locations of Nordstrom, and a sales increase of 4% at its Nordstrom Rack. As for the full year, the department store retailer is now expecting earnings from $3.50 to $3.65 a share, which is up from its prior estimates of $3.35 to $3.55 per share. The company added that sales at same-stores could increase by up to 2% during its fiscal 2018, in comparison to a prior range targeted of 0.5% to 1.5% growth. Revenue was forecasted to be as high as $15.4 billion in comparison to a previous estimate of $15.3 billion. Earlier in 2018, Nordstrom called off plans it had to go private after a price was not reached. It wanted to leave the public market to avoid the challenges that owners of department stores face today such as investment that need to be made in order to compete with companies such as Walmart and Amazon, while maintaining happiness amongst shareholders.